In the early 1980’s, a Danish drummer placed an ad in a California newspaper looking for jam buddies and face-melting thrash metal was born. Over the course of the decade, Metallica built a genre and the world’s most passionate fan base with raw, gritty rock n’ roll. But suddenly the band’s sound changed. It became harmless and radio-friendly. Metallica’s 1991 “Black Album” was certified 16x platinum, earning the band tens of millions of dollars, sold out arenas around the globe and the coveted headline slot at Dreamforce. But unsurprisingly, The Black Album has become almost synonymous with “selling out.” According to punk purists, musicians stopped sticking it to the man and started happily cashing his checks. Perhaps Lars Ulrich was smiling somewhere in pink pants as iconic menswear startup Bonobos announced it was being acquired by Walmart back in June. Overnight, Bonobos gained access to $300+ million of capital, meticulously established distribution networks, and a wealth of retail experience, ultimately allowing the store to lower their prices. However, the acquisition was also met with intense backlash from longtime customers that has many enterprise retailers and ecommerce startups such as Birchbox taking notice. Despite this serious red flag, the rush to acquire ecommerce and tech unicorns will grow stronger in 2018. In the coming months and years, a plethora of hip e-commerce brands will have their “Metallica moment” as FORTUNE 500 retailers come bearing gifts with a lot of zeroes. The decisions these brands make will shape the future of ecommerce. To understand why large stores are throwing hundreds of millions of dollars at startups, it is important to understand how market dynamics have turned on big-box retail. A perfect storm of changing consumer preferences, technology advances, and influxes of venture capital have allowed ecommerce unicorns to achieve hyperbolic growth. And the numbers keep getting bigger. As Walmart announced the Bonobos acquisition, Target kicked the tires on acquiring Casper, only to invest $75M in the company ahead of a possible IPO. Stitchfix went public. Warby Parker is valued at over $1B. Jet.com and Chewy.com were acquired for $3B+ a pop. Create a unique twist on an antiquated product or service targeted at young professionals with disposable income. Bonus points if it is something mom no longer buys or does for them. Gain a cult following of Instagram stars and loyal customers who won’t stop telling their friends how great your product or service is. Raise venture money to spend aggressively on advertising, immediate profitability be damned. Enjoy hyper-inflated valuation based on brand equity rather than stable P & Ls. As funds like Forerunner Ventures have moved from relative obscurity to become Silicon Valley darlings, tens of millions of dollars will continue to pour into VC backed ecommerce in 2018. There should be no condescension directed at these brands — many of them have built brilliant products that fit a clear market niche. But their potential value to large retailers goes well beyond the products. It’s all about opening up access to a stubbornly elusive segment. There’s a fairly solid profile of the consumer who is keeping FORTUNE 500 retailers up at night. Generally a professional somewhere between 24-40, lives in or commutes to a large city, has some disposable income, bachelor’s degree or higher, active lifestyle, etc. Relative to many other consumer segments, the “millennial with spending money” or HENRY is a small demographic but one with massive social capital and lifetime value. Due to a combination of brand image, logistics, and their own ineptitude, this is a customer that legacy retailers simply can’t connect with. A decade ago, American Apparel had 30 year-old professionals waiting with baited breath for every catalog. Today, that catalog is just a coaster for craft beer. Wakes up on a Leesa mattress ready to conquer the day. It sits on an IKEA bed frame that was assembled by a TaskRabbit. So meta. Checks the outfit in her latest StitchFix package. Looks good! Completes the look by tossing on her Warby Parker glasses. Time to decide on shoes. Initially slips into a pair of AllBirds but remembers she has a client meeting so she opts for a pair of Rothy’s. Comes home after a long day. Her boyfriend is halfway through cooking this week’s HelloFresh recipe while the pooch dines on pork and string beans from The Farmer’s Dog. Notices she’s running low on detergent, dish soap, and some other essentials. Presses the magic button on her Amazon Dash Off to Boston tomorrow! Packs her Away suitcase with the latest Birchbox cosmetics. Notice that there is not a single product purchased from a large brand present anywhere in this workday. A day that traditionally could have only been achieved through visits to several department stores was done entirely online, without interacting with a single intermediary other than Amazon. Suddenly, $1B for Casper seems like a discount, $3B for Jet is a steal and whatever IKEA paid for TaskRabbit is highway robbery. Expect bigger numbers to rock the street next year. Among the most sobering realizations for Walmart and most legacy retailers is the raw, honest feedback on how they are perceived by a large percentage of the customers they hope to win back from Amazon. While Walmart is most often cast as the vampire squid, all large conglomerates are vulnerable. Bessemer famously passed on Dollar Shave Club thinking that Gillette could easily capitalize on economy of scale to build a similar service with better margins. Spoiler alert, they did and it failed spectacularly. While the press has fallen in love with the “retail apocalypse,” the rise of “indie ecommerce,” and whether or not it stays independent is an equally important theme in the marketplace. The future of large retailers may rest in aligning with the very brands that were founded to capitalize on their vulnerabilities. Competition makes strange bedfellows. Ultimately, the power will rest where it always does — with the consumer. We’ve seen this movie before, most recently when Anheuser Busch’s purchase of indie darling Goose Island opened the floodgates for consolidation of the high end swill market. In the end, the vast majority of Goose lovers stuck with the brand, realizing the product was the same ale they knew and loved. 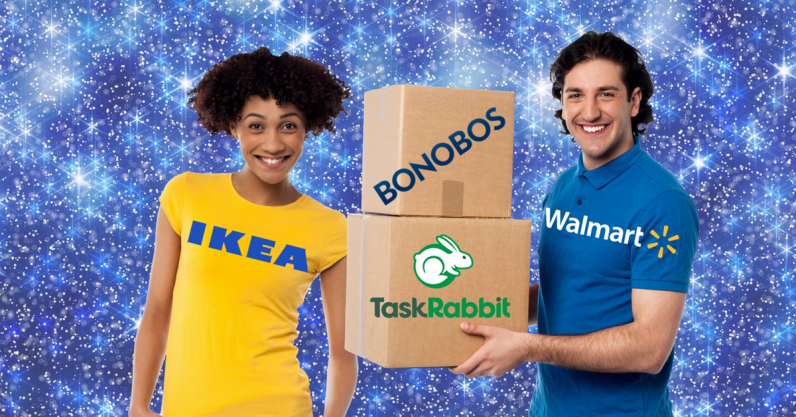 If Bonobians come around and continue to support the brand as a Walmart entity and IKEA can grow TaskRabbit, expect a hell of a lot more aggressive offers and a new type of retail conglomerate emerging in 2018, poised to take on Amazon.